Physical Description Paul is 5 feet 7 inches with black hair and Green eyes and weighs in at 177 lbs, he is 37 years old and clean shaven. Ambitions His main ambition is to gain a Command of his own, showing Starfleet Command what they have missed these past few years. Personal History Paul was born in London, England - Earth to Shaun and Mary Winchester on the 14th of May 2351. When Paul was a young lad, he used to dream about going to the stars. Every night he would look up at the stars and wish that one day he could go into space. It was a promise his father had made him keep, the same promise that his elder Sister had also kept. During his teen years, Paul always looked to the stars knowing full well that his destiny lay up there. He began training for his pilot's licence, as he hoped it would hold him in good stead for when he applied to Starfleet Academy. After his last holiday to Risa, he received news that he had been accepted at Starfleet Academy as soon as he turned 18. He would then have realized his dream to explore the universe and see other worlds outside the Federation. Whilst in the Academy he had heard rumours about his elder Sister Paula being a Lesbian, but Paul tried to tell them that they were wrong and tried to stand up for his elder Sister, it wasn’t until Paula’s Graduation that the truth came out and Paul would not talk to his sister for the next 4 year. After getting into trouble at the Academy, Paul thought that it would be a good idea to join the Starfleet Engineering;. He could still see the stars and fulfil his dream of setting foot on other planets. Paul later took the position of Engineering Officer aboard the USS Cambrian; after he had been passed over for promotion a number of times by the Engineering Chief. A few years later, on his birthday, Paul received his promotion to Lieutenant for his outstanding record and service. and hoped that his next assignment upon the USS Soval would bring more chances to work on newer warp cores. For the next year Paul redeemed himself by becoming once more a Engineering officer when the Soval’ s chief had seen that he had been unfairly treated and had restored him to his position. In 2379 Paul was assigned as an Engineering Officer aboard the USS Hyperion -F until 2381 Paul was told of his next assignment which was the USS Nagasaki as its Assistant chief Engineering Officer. A year later Paul was reassigned to the USS Gemini as the Assistant chief Engineering Officer it was during the two years, Paul found himself falling in love with Marine Captain Elizabeth "Siren" Stone his wing commander who later after an accident became the Gemini's Chief Security Officer now having thoughts about getting hitched. Whilst they had started planning their nuptials, Paul had heard something that he didn't like and flipped. He then lost his temper at Lieutenant Aya and now finds himself once more alone and having to spend time with the Gemini’s Counsellor over the issue as well as Siren leaving for Starbase 249.
in 2384 Paul was reassigned to the USS Reliant as a Engineering Officer as he felt that flight was not for him anymore, on his way to the Reliant that he was informed that he was to be reassigned again to the USS Cavalry, Now Paul is awaiting his next assignment from Command. 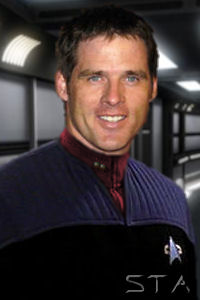 During his tour year tour on the USS Cavalry, Paul was told by the ships Captain that due to his actions on the USS Gemini that he would have to prove himself to regain the position he once had that of assistant chief Engineering Officer as he knew that he now regretted it, he also now regrets turning his back upon his Sister Paula and Plans to contact her. Now it is 2388 and to Paul's amazement he not only has he regained his rank of Lieutenant but the a promotion to that of Chief Engineering Officer aboard the USS Odyssey and hopes that this new chapter in his life is a new beginning for him. Now it is 2393 an Paul has been transferred to the USS Tomcat as the new CAG. Being back in a fighter cockpit had been a welcome change for him, On his first flight back in the cockpit disaster struck as his throttle jammed open sending him into the hanger bay which cost him his left arm. Now with a prosthetic arm thanks in part to the Tomcat's CMO, Paul survived the crash, now thanks to some intel that he had gathered and now has been moved into Intelligence whilst the chief is in hibernation.